Trump’s Air Strikes against Syria. The More They Explain, the Less They Make Any Sense! The More They Explain, the Less They Make Any Sense! The night before the UN experts (OPCW) were scheduled to travel to Damascus for a fact-finding mission about the alleged chemical attack in Douma, the US launched military strikes against Syria. Apparently President Trump could not wait for the UN experts’ findings and had to order “strikes on targets associated with the chemical weapons capabilities of Syrian dictator Bashar al-Assad” on Friday night. 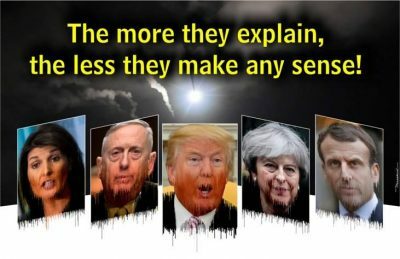 Considering just 12 hours before the strikes on Syria (in regard to the evidence of chemical weapons) General Mattis (Mad Dog) clearly stated that “we are still assessing the intelligence … we are still working on this…”. So the question remains how, by bypassing the UN experts, did the US, UK and France conclude that a military strike against Syria was in order in such a short time? Furthermore, if the US, UK and France were already aware of the “targets associated with the chemical weapons capabilities” in Syria, why didn’t they ever bring this information to the UN to prevent the next “chemical” attack against innocent people? “The purpose of our actions tonight is to establish a strong deterrent against the production, spread, and use of chemical weapons”. “On 23 June 2014, the last declared chemical weapons were shipped out of Syria for destruction. … The actual destruction operations, performed by a team of U.S. Army civilians and contractors, destroyed 600 metric tons of chemical agents in 42 days”. Are the American, British and French Generals suffering from total amnesia? The so-called “international” coalition is trying hard to assure everyone that the aim of the military strikes against Syria is not “regime change”; we are simply sending a message! They are bombing Syria because they are “against barbarism and brutality”. Mr. Trump even jumps to the history and reminds us of “the evil” of chemical weapons in “World War I”, but he skips the fact that eight million tons of Napalm bombs were dropped over Vietnam or how the toxic chemical Agent Orange was used by the US military in that War. Of course Mr. Trump and his generals would not mention anything about the Israel’s repeated firing of white phosphorus shells over densely populated areas of Gaza, burning innocent bodies of the school kids. All wars of aggression start with big lies and fake news. Warmongers are irrational by nature; they wage their wars under false pretenses. Peace activists should expose these lies and unite with other democratic minded people locally, nationally and internationally. In achieving PEACE, national chauvinism has no place. Say no to all wars. Massoud Nayeri is a cartoonist based in the US. He is a frequent contributor to Global Research.